She should be easy for ICE to find now. Talk about flaunting disrespect for the law. This never ends well. So nice of CA taxpayers to give American jobs to foreigners. The Reconquista is proceding nicely. So now the GOVERNMENT of California ITSELF is openly employing an illegal alien. This is a huge F-U to the Rule of Law and to Trump. You got that right. When they play cutesy games we must call their bluff. This b*tch need to be shuttled back across the border ASAP. By ignoring these "pranks" over the years, we have only emboldened them. Oh, and if she is "undocumented" does that mean her tax liabilities are also "undocumented" ? IS the USA a nation of laws? Did Governement elected officials SWEAR to uphold the law. Then...what are we waiting for, a riot, revolution or Civil War. Where are the US Marshall’s??? Anyone who hides a wanted criminal from federal officials could be prosecuted for harboring a fugitive. According to 18 U.S. Code § 1071, it is an offense to harbor or conceal any person for whose arrest a warrant or process has been issued, so as to prevent the fugitives discovery and arrest. Also, 8 U.S. Code § 1324 prohibits sheltering illegal aliens from authorities. Breaking these laws can cost up to five years behind bars. Alien Smuggling  Subsection 1324(a)(1)(A)(i) makes it an offense for any person who  knowing that a person is an alien, to bring to or attempts to bring to the United States in any manner whatsoever such person at a place other than a designated port of entry or place other than as designated by the Commissioner, regardless of whether such alien has received prior official authorization to come to, enter, or reside in the United States and regardless of any future official action which may be taken with respect to such alien. Domestic Transporting  Subsection 1324(a)(1)(A)(ii) makes it an offense for any person who  knowing or in reckless disregard of the fact that an alien has come to, entered, or remains in the United States in violation of law, transports, or moves or attempts to transport or move such alien within the United States by means of transportation or otherwise, in furtherance of such violation of law. Harboring  Subsection 1324(a)(1)(A)(iii) makes it an offense for any person who  knowing or in reckless disregard of the fact that an alien has come to, entered, or remains in the United States in violation of law, conceals harbors, or shields from detection, or attempts to conceal, harbor, or shield from detection, such alien in any place, including any building or any means of transportation. Encouraging/Inducing  Subsection 1324(a)(1)(A)(iv) makes it an offense for any person who  encourages or induces an alien to come to, enter, or reside in the United States, knowing or in reckless disregard of the fact that such coming to, entry, or residence is or will be in violation of law. Conspiracy/Aiding or Abetting  Subsection 1324(a)(1)(A)(v) expressly makes it an offense to engage in a conspiracy to commit or aid or abet the commission of the foregoing offenses. Bringing Aliens to the United States  Subsection 1324(a)(2) makes it an offense for any person who  knowing or in reckless disregard of the fact that an alien has not received prior authorization to come to, enter, or reside in the United States, to bring to or attempts to bring to the United States in any manner whatsoever, such alien, regardless of any official action which may later be taken with respect to such alien. Unit of Prosecution  With regard to offenses defined in subsections 1324(a)(1)(A)(i)-(v), (alien smuggling, domestic transporting, harboring, encouraging/inducing, or conspiracy/aiding or abetting) each alien with respect to whom a violation occurs constitutes a unit of prosecution. Prior to enactment of the IIRIRA, the unit of prosecution for violations of 8 U.S.C. § 1324(a)(2) was each transaction, regardless of the number of aliens involved. However, the unit of prosecution is now based on each alien in respect to whom a violation occurs. Knowledge  Prosecutions for alien smuggling, 8 U.S.C. § 1324(a)(1)(A)(i) require proof that defendant knew that the person brought to the United States was an alien. With regard to the other violations in 8 U.S.C. § 1324(a), proof of knowledge or reckless disregard of alienage is sufficient. Penalties  The basic statutory maximum penalty for violating 8 U.S.C. § 1324(a)(1)(i) and (v)(I) (alien smuggling and conspiracy) is a fine under title 18, imprisonment for not more than 10 years, or both. With regard to violations of 8 U.S.C. § 1324(a)(1)(ii)-(iv) and (v)(ii), domestic transportation, harboring, encouraging/inducing, or aiding/abetting, the basic statutory maximum term of imprisonment is 5 years, unless the offense was committed for commercial advantage or private financial gain, in which case the maximum term of imprisonment is 10 years. In addition, significant enhanced penalties are provided for in violations of 8 U.S.C. § 1324(a)(1) involving serious bodily injury or placing life in jeopardy. Moreover, if the violation results in the death of any person, the defendant may be punished by death or by imprisonment for any term of years. The basic penalty for a violation of subsection 1324(a)(2) is a fine under title 18, imprisonment for not more than one year, or both, 8 U.S.C. § 1324(a)(2)(A). Enhanced penalties are provided for violations involving bringing in criminal aliens, 8 U.S.C. § 1324(a)(2)(B)(i), offenses done for commercial advantage or private financial gain, 8 U.S.C. § 1324(a)(2)(B)(ii), and violations where the alien is not presented to an immigration officer immediately upon arrival, 8 U.S.C. § 1324(a)(2)(B)(iii). A mandatory minimum three year term of imprisonment applies to first or second violations of § 1324(a)(2)(B)(i) or (B)(ii). Further enhanced punishment is provided for third or subsequent offenses. Whatever keeps Democrats in power. Why aren’t they allowed to vote? Just because they happen to be living outside America, they should not be deprived of their right to vote Democrat. Of course, ICE will nowhere to be found. California is a state in rebellion. This must not stand. Mateo needs to be arrested and deported immediately, and various state officials who are engaged in a conspiracy to aide illegal alien criminals (such as the mayor of Oakland) must be arrested and charged in Federal courts. If they are not, the rebellion will spread and subvert the USA. How do they pay him? No surprise here, after all, an undocumented was elected (twice) as President of the United States. Impressive and ballsy move of defiance. We could solve California’s “rebellion” problem quickly if we just made certain that only legal American citizens could vote there, a.k.a. enforcing the law. As it stands American citizens in California are being disenfranchised by having their votes outweighed by the illegal aliens who have been brought in just for that purpose. Why hasn’t ICE picked her up yet?! Calling AG Sessions, wake up! When Obama was in office any state that wanted to act against illegal aliens was taken to court because that’s the Feds job and the states have no say! Now, the Democrats are saying that states can do whatever they want when it comes to illegal aliens and the Feds have no say! Whatever works at any given moment. With Dems the Rule of Law only works in one direction: theirs. Obama seems to have renounced our nation......acts like he never heard of the United States of America. Obama seems more at home in Kenya.......meddling in their elections. 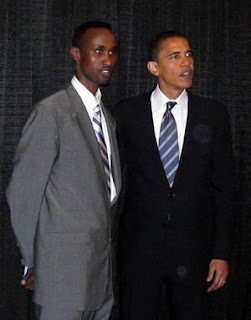 Barack Obama with Mohamed Abdi, Somali muslim candidate for Mandera East, Kenya who lost. He’s nothing but an anti American who really hates white folk. CA state government is now full of these types because that’s exactly who they hire!